Welcome to Latina In the Ivory Tower! Welcome to Latina in The Ivory Tower! This series will chronicle my experience as a graduate student navigating Lehigh University and all the realities that come with it. As a junior in college, I was searching for mentors in academia, who looked like me but there weren’t many. Every time I felt like I was drowning, I went online to search for others experiencing the same pressures. There were articles that talked about the hardships of research, finding the right advisors, balancing an academic life with a social life and yet none of these blogs reflected ME. I launched my blog, Latina in the Ivory Tower, for other women of color who are also fighting to decolonize these institutions of higher education. As Educated Latinas, walking through our campuses, speaking out in our classes, and graduating are acts of resistance. I partnered with Educated Latina to write about the struggle and joys of this academic life and I will write for all the Mujeres who paving the way for us. I partnered with Educated Latina to write about the struggle and joys of this academic life. I will write for all the Mujeres who are paving the way for us. At age 17, I moved from South Central, Los Angeles to Bethlehem, Pennsylvania to begin my college career at Lehigh University. I applied to 4 UC’s, 4 Cal States and 10 private universities all over the East Coast. I did not have a top choice, I simply wanted to go to college and move out of the West Coast. I received my acceptance letter from UC Berkeley and Lehigh on the same day. I had two choices 1) attend a university ranked top 20 in the nation or 2) attend a university that no one heard about but would give me an opportunity for a new life. I decided to take a chance and go to Lehigh. When I was searching for colleges I never concerned myself with the demographics of the student body, the extracurricular activities on campus, or the campus amenities. I just wanted to attend a top university and receive a good financial aid package. Getting into college was one thing but staying and graduating was another monster. As a first-generation American and first-generation college student, I was not aware that I would be attending a predominantly white institution (PWI), sitting in classrooms with legacy students, and students who came from wealthy families. I was experiencing a massive culture shock. Not only that but during my first semester, I struggled in my intro courses such as English and Calculus. Some of my peers came from private high schools and had private tutoring that prepared them for college-level work. I was always a high achieving student enrolled in honors and AP courses, but somehow I was still struggling to grasp the material. I could not afford to stress my family out with my struggles and I definitely could not afford a low GPA and risk my financial aid. I had to create my niche so I became involved with the Office of Multicultural Affairs and sought mentorship from the Director and student leaders. After successfully completing my first year at Lehigh, I realized that I had entered a new world: the Ivory Tower. The ivory tower (in other words, the elite, and extremely privileged education institution) was not built for me, a low-income, first-generation, Salvadoran-American woman from South Central. Yet, with the support of my village, from coast to coast, I graduated with my Bachelor’s degree in English and Journalism in May 2015. I decided to stay at Lehigh for graduate school. Although I stayed at the same institution, I embarked on a new journey when I began my Masters program the Fall. P.S.- You can find me here every 10th of the month. 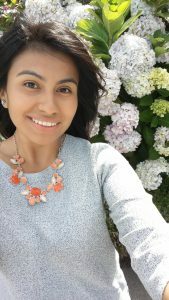 Brenda is a first generation college student at Lehigh University and is currently in graduate school finishing up her Master’s degree in English. She is a proud Educated Latina from South Central, Los Angeles and holds her Salvadoran roots dear to her heart. She spends her spare time checking out local cafes in the Lehigh Valley and searching for new books to add to her personal library. Dare to Dream is a non-profit organization that works with middle school and high school Latinas to encourage and support their efforts to graduate from high school, to encourage college enrollment, and to introduce them to college and career role models. Conference, you learned about the world of opportunities that open up to people who pursue an education, and you met inspiring Latina women who have been successful in their careers. I relate to this 100%. Thank you for sharing. You’re welcome Melanie! We are brought together through our shared experiences.